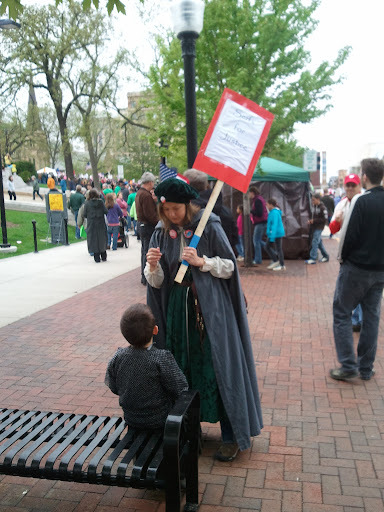 The sign says "Serfs for Justice." The kid is wearing chain mail. There was another rally at the Capitol on Saturday. I’d been hearing rumblings from people in the weeks since the Sarah Palin counter-rally that we needed to have another rally. 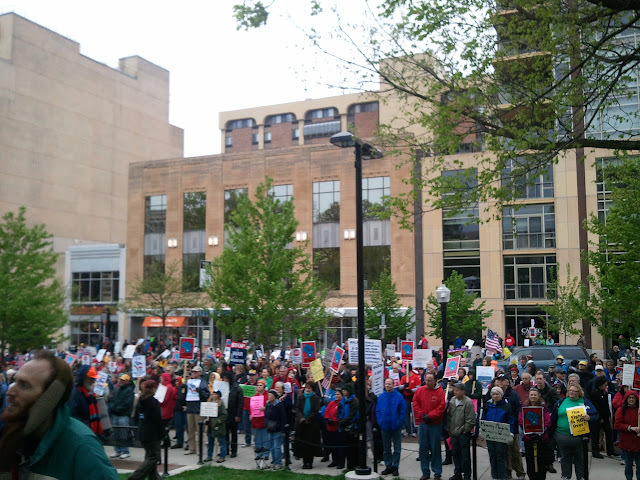 The rumblings mostly came from people outside Madison who wanted an excuse to come to town and hang out with a few thousand similarly angry folks. These people feel like the only way for them to deal with what’s going on is to go to Madison with clever signs and make some noise. Their sentiments are in the right place, but I’m inclined to cite them with a lack of imagination. There’s a lot they could be doing, starting with networking with the other angry, isolated people in their areas so they can stop feeling disconnected and outnumbered. They are disconnected; they aren’t nearly as outnumbered as they feel. If I know of six people in Eau Claire who want to help out (and I don’t even know where Eau Claire is without asking Google) then there’s no reason people who live there can’t find each other. Anyway, there were rumblings wanting another rally, and it had been a few weeks, so having one just to show we still could was warranted. This one started later than many of the other Saturday rallies – unlike Sarah Palin, we respect the Farmer’s Market and share the space. So the official rally started at 3pm, with pre-rally music starting at 2:30. I got there with Don at 2:15 an immediately went into anti-panic mode. 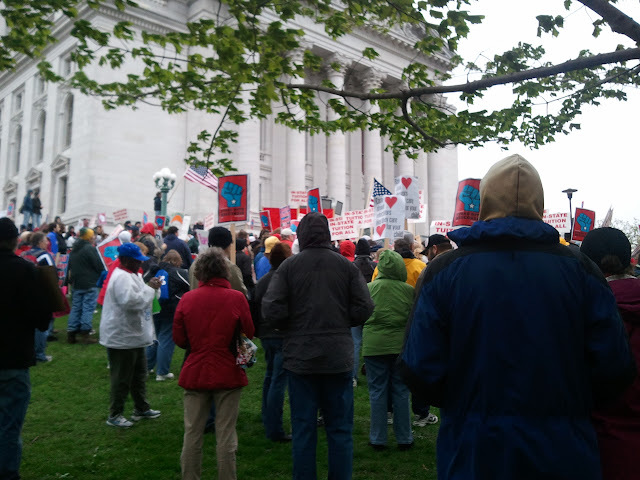 The crowd was small, and all the derogatory things I said about the Tea Party’s muster were running through my head because it looked like now they were going to apply to us. That was not cool; I said really mean things about the size of the Tea Party crowd. Official numbers put the crowd around 10-15k. That sounds right to me. Just after 2:30 the bells from the church on the corner of W. Washington started going berserk. Somebody was getting married and the wedding wrapped up just as the protest was getting started. The wedding party was on the sidewalk trying to take pictures when the Teacher’s Union went by. I don’t think I’d ever heard the bells from that church before, but they’re quite nice, and added to the rally atmosphere very nicely. This is the first time you can legitimately fault us with damage to the lawn. They can have their precious grass when we get our rule of law back. 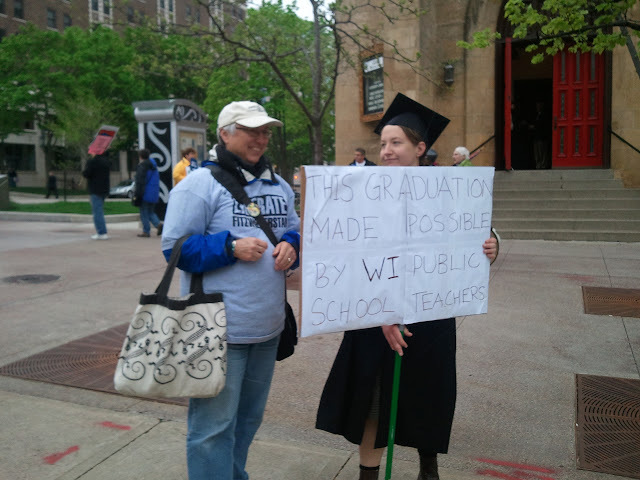 A lot of people spoke at the rally about a lot of things, but the message I hope everybody took away was Erpenbach’s. He started off thanking his wife and kids for carrying on while he was in Illinois, with a thanks to the State Police for being kind of enough to check in on his family as often as they did. Then he thanked the crowd for being there. He followed that up with telling everybody, “I don’t want to see you here anymore.” We’ve got recall campaigns to run. We’ve got bad legislation to fight. 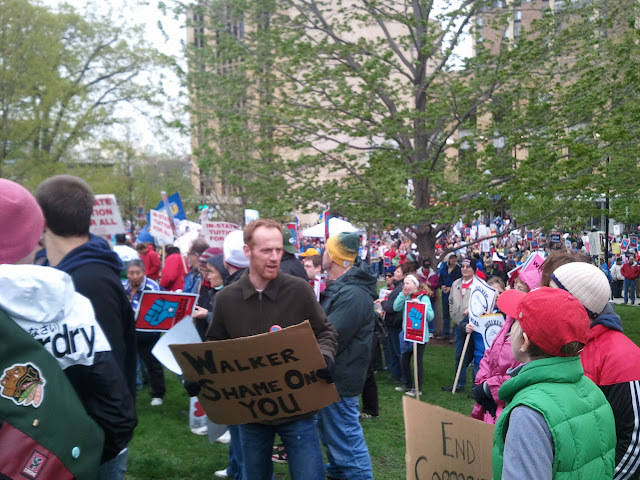 Then we have the Walker recall to run, and another campaign after that. And, he didn’t say it, after that it’s time to ramp up for the presidential election. I'm irrationally fond of this image. I think it's the tree branches. It’s time we chucked this Madison vs the rest of the state nonsense out the window, and invited the rest of the state to join our delusion. It’s time to move past making noise at the Capitol and started getting to work doing things. Yup, we’re still here. Now, let’s go away and be productive.